The product offers a wide spectrum of variation, now that we’ve entered it. Tables vary in height and so does this chair. Raising and lowering seat height is as easy as pulling on the familiar lever and naturally moving in the desired direction. This grants a wiggle room of 32 to 40 cm above the floor. Apart from the chair itself, the accompanying armrests may also be personalized to your requirements. Being 4D adjustable, the rests will slide into any orthodox position with ease, of course also offering some height adjustment too. They’ve also managed to include clockwise and anti-clockwise rotation. Cushioning om the armrest is the same heavenly high quality cold-molded foam. Moving further down, past the aluminium star base, we come across the mode of transport in the form of wheels. We’ve all seen old office chair wheels and how they make a terrible squeaky noise after a while. These alloy style caster wheels, however, aren’t your ordinary set of wheels. Free to swivel as they please, the clean contacts give an unmatched sense of strength, durability and grace. Sliding across carpets, tiles and even perhaps wooden floors is a hushed affair which won’t attract much attention. Arriving to the final product does indeed require some assembly, all of which being superbly clear and explanatory. Needing no extra apparatus at all, all the pieces slide in together like one large puzzle, orchestrated to perfection. Alongside the main body, the package includes headrest and lumbar support cushions; noteworthy accessories. Designed exactly like the rest of the product, with the same cushioning too, they are easily added or removed using straps. The neck rest could prove vital for films or gaming in the long run and the lumbar cushion is an opportunity to further comfort your spin throughout the hugging design of the chair. GT Omega Racing are a formidable brand, across the world and also on the Maltese shores. 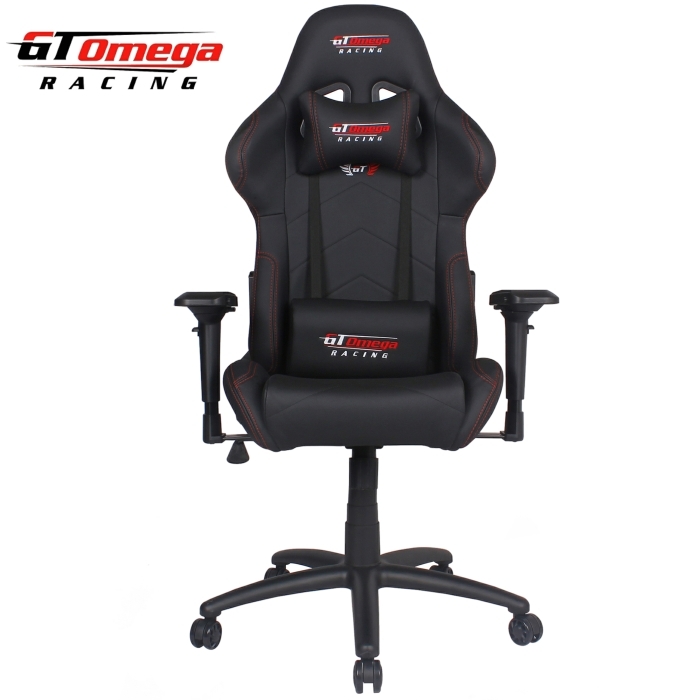 The GT Omega PRO Racing Office Chair, Gaming Chair or whatever you’re going to use it for, looks to be a fantastic buy for the worthy price of €250. Potentially transform your back-straining life into a well-deserved lay back.